The food your kids see on TV isn’t exactly nutritious… But we’ve got expert tricks to get your kids craving something healthy! Our CEO and Nutritionist Stacy Goldberg was featured on WDIV Local 4 in their recent segment Parents Can Get Creative To Counteract Food Ads. Engage your kids by filling celery sticks with a low fat cream cheese and topping them with Qwackers Cheddar Crackers, a healthier option than Goldfish. Stacy’s top health tip is to get creative and involve your kids in food preparation. Make snacking fun by letting your kids decorate a cellophane bag with their favorite cartoon characters and heroes. Fill the bags with Surf Sweets Gummy Worms, Brothers All Natural Fruit Crisps, and Kay’s Naturals High Protein Cereal. This still gives kids the gummy candy but also provides something that’s more nutrient dense. Create an interactive dessert by layering a protein-filled Don’t Go Nuts Chocolate Soy Spread between two Homefree Chocolate Chip Mini Cookies. Kids love muffins and getting involved with baking recipes in the kitchen. Step away from the traditional muffin mixes and experiment with all natural baking mixes such as Jessica’s Gluten Free Muffin Mix next time you make a sweet treat! Watch this full clip from WDIV Local 4 / ClickOnDetroit to see our CEO & Nutritionist Stacy Goldberg talk about more of the hottest nutrition tips for kids! It’s that time of year again…back-to-school is fast approaching. At my house, I am busy organizing folders, filling out paperwork and yes, testing healthy back-to-school meal and snack options! My kitchen and Savorfull offices has turned into a test kitchen with my kids, their friends and of course, our Savorfull team. This can be an overwhelming task for many parents! This month, in my column, Eat Right Now, featured in the Detroit Jewish News, I focus on Healthy Hacks For Back-To-School. As I walked through the aisles of Target getting my sunscreen last month, I caught a glimpse of backpacks and binders being set up for back-to-school. My mind immediately started thinking about lunches, snacks and fueling my kids for their extra-curricular activities. As parents well know, getting ready for work and school in the morning can be incredibly stressful. Rushing the process may lead to making unhealthy, unsatisfying choices at breakfast, lunch and in-between. A poorly packed lunch not only slows down productivity in the afternoon but contributes to weight gain. According to the CDC, the percentage of children with obesity in the United States has more than tripled since the 1970s. Today, about one in five school aged-children (ages 6-19) has obesity. Putting together a balanced midday meal may be a dreaded task in your home, but packing a lunch need not feel like a chore this school year. Dedicate a fraction of your Sunday to lunch-packing prep. Prepare soups, salads or leftovers into BPA-free reusable containers for easy additions to lunch bags during the week. Cook quinoa or brown rice ahead of time and have whole grains on hand. If you can’t find time to prep a full week of meals, plan a weekly family menu to eliminate time spent scouring the fridge for lunch foods. Before heading to bed, put the finishing touches on your lunch to eliminate stress the next morning. Pack any foods that weren’t pre-prepped earlier in the week, such as crackers, dips and dressings. For hectic mornings, keep grab-and-go lunch options within reach to ensure no one misses the bus. Stock an area of your fridge with pre-cut and washed fruits and veggies that can be added to lunch bags in a time crunch. When rushing out the door, toss Greek yogurt, string cheese, individually portioned guacamole or hummus into your kids’ bags for a nutritious boost. Tupperware with multiple compartments makes lunch-packing easier. This helps with portion control and allows organization for all your food groups. When shopping for containers to store your foods, look for products labeled BPA-free. BPA is an industrial chemical used to make polycarbonate, a hard, clear plastic, which is used in many consumer products. Several studies have proven that health risks are created due to this chemical seeping into food over time. Think outside the lunch box. The 2010 Healthy, Hunger-Free Kid Act helped transform school meals and snacks with the most recent Dietary Guidelines for Americans. 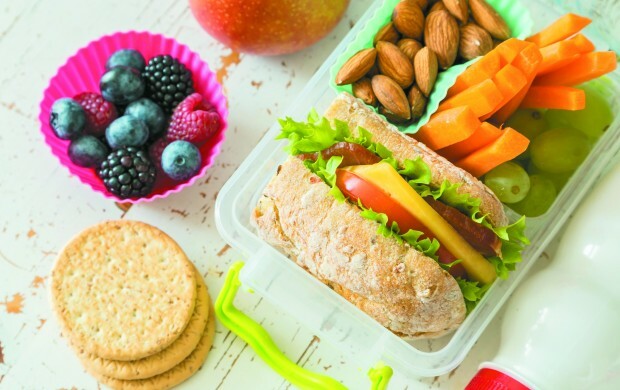 When packing lunch for your child, include lean proteins, brightly colored fruits and veggies, whole grains, healthy fats and calcium-rich dairy products (or non-dairy alternatives). Instead of your standard PB&J, try it on a stick! Cut your sandwich into squares and place onto skewers with pieces of fruit in between. For a peanut-free alternative, try Don’t Go Nuts Soy Nut Butters with sprouted grain bread. Alternatively, try a PB&J burrito with raisins or unsweetened dried cranberries. To amp up the protein and fiber, look for tortillas infused with added protein and fiber, such as La Tortilla Factory. Lunchables are a classic favorite for kids but often filled with sugar and fat. Make your own nacho or taco bento boxes and swap out your traditional tortilla chip for Beanfields chips. This provides more protein and fiber in the diet for sustained energy. Include beans, olives, guacamole, shredded cheese and diced veggies for an awesome home-made lunchable. Mix it up with monochromatic lunches and let your child decide which color and foods he desires. For example, if choosing the color green, you can offer cucumbers and broccoli dipped in avocado, fresh or dry roasted edamame and grapes or kiwi for dessert. Skip the sugary fruit snacks and opt for Brothers All Natural Fruit Crisps. Make fruit fun, crunchy and healthy with interesting flavors such as pear and apple cinnamon. Mix with nuts, seeds or cereals for a fast and easy trail mix. For a nutrient-dense treat, try a s’more sandwich using a gluten-free supergrain-filled Kind Healthy Grains Bar cut in half in place of graham crackers, Don’t Go Nuts chocolate spread (think peanut-free, low-sugar Nutella) or high-protein Nakee butter and all-natural marshmallows from Trader Joe’s. Need a gluten-free option? Try cereal-dipped bananas! Crush up a low-sugar, high-protein cereal such as Kind Protein Peanut Butter Granola or Kay’s Naturals, roll the banana first in peanut, almond or soy-nut butter, then immerse it in cereal for a nutritious snack. You can even freeze these for an end-of-summer treat. Swap traditional cut-up fruit for a fruit cone. Use an organic ice-cream cone such as Let’s Do Organic Sugar cones and fill with your fresh fruit to keep it lively for kids. You could also make a waffle cone sundae using Nutritional Choices Waffle Bites and top them off with vanilla Greek yogurt, fresh berries and a few dark-chocolate chips. Note: Many of the snacks suggested in this article are available at savorfull.com.